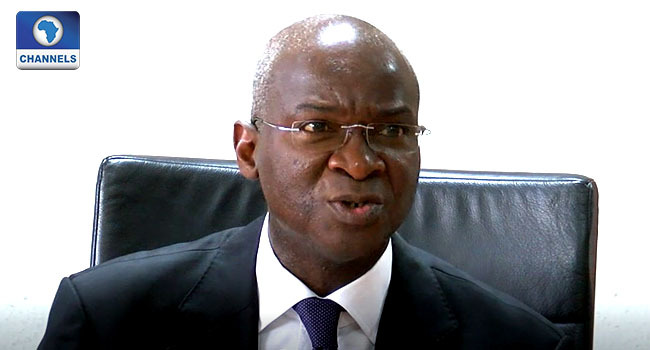 The Minister of Power, Works and Housing, Mr Babatunde Fashola says his ministry could not get the names of corrupt contractors alleged to have looted funds in the power sector. The Socio-Economic Rights and Accountability Project (SERAP) in a statement on Sunday by its Deputy Director, Mr Kolawole Oluwadare, said Fashola noted that the ministry does not have information on corrupt looters in its record. “We have searched the ministry’s record and the information you applied for is not held by the Federal Ministry of Power, Works and Housing (Power Sector),” the minister was quoted as saying. Fashola’s comments come barely a month after SERAP filed a Freedom of Information (FOI) request, asking him to publish the names of contractors who have failed to meet the terms of contracts they signed from 1999 to 2018. SERAP made the call following allegations by Mr Atiku Abubakar, a former vice president and presidential candidate of the Peoples Democratic Party (PDP). Responding through the Director of Legal Services in the ministry, Mrs Shoetan Adesola, Mr Fashola acknowledged the request, stressing that the issue has been resolved under the FOI Act. “The Ministry has searched for the requested information on details of alleged contractors and companies that collected money for electricity projects and failed to execute any projects, but we could not find it from our records. “I am directed to acknowledge the receipt of your letter dated 4th January 2019 in which you applied for the request to disclose details of alleged corrupt contractors and companies that collected money for electricity projects but failed to execute any projects. The request has been handled under the FOI Act,” she stated. The organisation had in January sued the Minister for failing to disclose specific names and details of contractors and companies that allegedly collected money for electricity projects but failed to execute them.